Every year, the President of my quilt guild hosts the annual Christmas party. Each party is unique, but there’s always food and some kind of entertainment. The President also gives a party favor to each member who attends—usually something she makes herself. One year, the President created these lovely picture frames made from fabric scraps. Look! They have magnets on the back so you can put them on your fridge! Isn’t that a great idea? To fill the frames, Mary cut out photos from magazines. I don't know what I like best about this one--the musical fabric or the chocolate photo! I had no idea how she made them, but Mary's a clever girl. Since it's been many years ago now, I figured she might not remember how she made them so I decided to challenge myself and see if I could find a way to recreate these cute picture frames. After a few fumbles, I finally got it figured out. First, supplies. You’ll need some fabric, a scrap of batting, and some stiff fusible interfacing or Timtex. To figure the size of your materials, first decide how big a photo you want to frame. Let’s say that you want to frame a 4” x 6”--a very common size. Now, add your frame width times two to both dimensions. Let’s say you want a 1” frame all around the photo. Times two, that’s 2”. Add that to both directions, and you end up with 6” x 8”. You’ll need to cut your batting and your interfacing this size. Cut one piece of fabric, for the back, 1/2” smaller than that in both directions. In this example, cut one piece of fabric 5-1/2” x 7-1/2”. Now for the big piece of fabric that forms the frame front, wrapping around the back just a little. Start with your interfacing/batting size, which in this case is 6” x 8”. You’re going to add a funky flange, so you need to add the seam allowance for that. So add 1” to both directions and you get 7” x 9”. Now you need to allow for the wrap around part--3/4" should do. Add 1-1/2" to both directions and you get 8-1/2" x 10-1/2". So cut a piece of fabric for the frame that size. Now to create the flanges which are totally optional, you need to choose a complimentary but contrasting fabric. Then cut a 2" strip, and subcut it to create the four flanges you'll need. I picked 2" because we're going to press this in half, and I figured 1" minus seam allowance (3/4") is all I'd want possibly covering the sides of my photo. 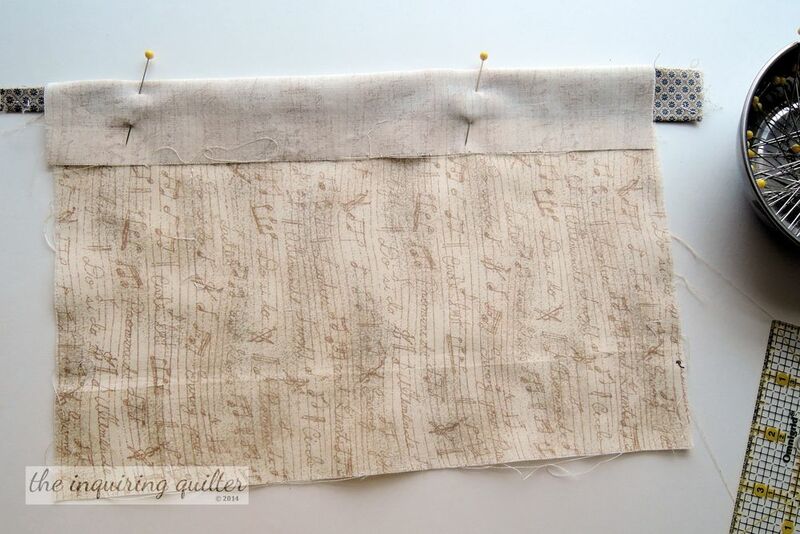 Cut two pieces that are 2" x the width of your interfacing plus 2". So cut two strips that are 2" x 8". Cut two more strips, 2" x the length of your frame plus 2". So cut two more strips, 2" x 10". Fold the flanges in half and press. 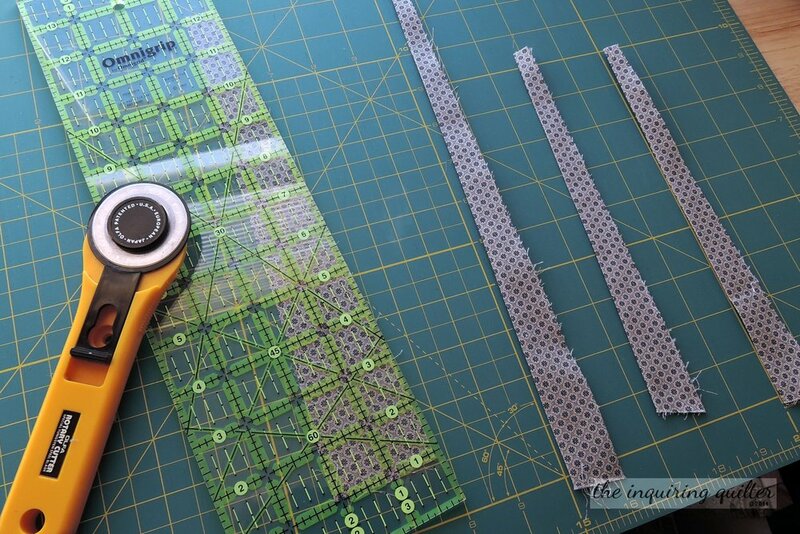 Cut each flange at a funky angle: Place the fold on the left and angle your ruler however you like. You want it fat at the bottom and skinny at the top like shown. Then cut. Fold the trim piece in half and press. Lay the first flange with its raw edges towards the top edge of the frame fabric, approximately the width of your frame plus 1/2" down from the edge. Since I'm using a 1" frame, I'm laying the flange 1-1/2" down from the top edge. The raw edges of the flange are pointed up towards the top edge of the frame fabric. The folded edge is closer to the center. Fold the frame fabric over the trim piece and pin. 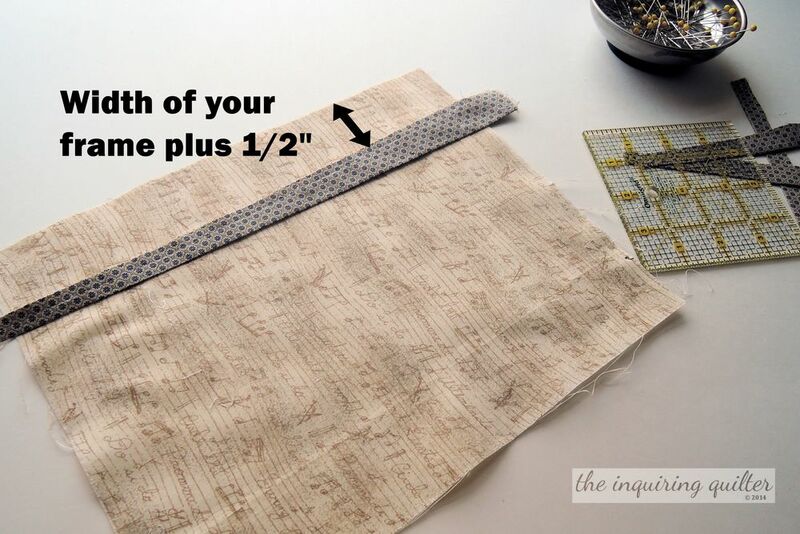 Sew a 1/4” seam. Press the seam open, then turn the frame fabric and add the next flange using the same method: lay the folded flange down (fold towards the center), then fold the frame fabric back over the flange, pin, and sew. Repeat for third and fourth sides. Flip the completed frame over and place the batting on top. Place the the fusible interfacing on top of that. Be sure to place the interfacing with it's fusible side up. Pin everything to hold it together temporarily then flip back to the front. Pin from the front (removing the pins you used to hold everything together from the back), pinning the frame border out of the way as shown. 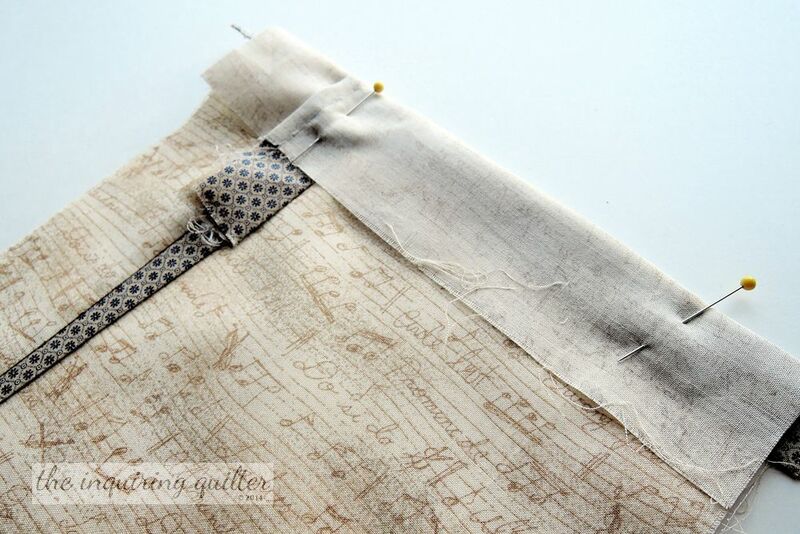 Sew a rough rectangle (it doesn't have to be perfect) and an X inside it to hold all the layers together. To miter a corner, fold the corner back, forming a triangle. Then fold the bottom edge over, and the top edge as shown. Pin each corner down if needed until you can fuse them down permanently. Removing pins as you go (so you don’t iron them! ), tap your iron along the folded down frame edge, just enough to hold it in place. Be careful not to iron the uncovered areas. When positioning the back fabric, make sure you cover the frame edges. Stick magnets on the back of the frame.